No Referring Link – Explained – Statcounter Blog. Your StatCounter “Came From” stats provide you with information about how people are coming to your site. In your “Came From” stats you will see a list of sites via which visitors come to your site. These sites which refer visitors to your site might be forums, blogs, search engines, directories or websites of any kind that provide links to your site. You may also see entries for “No Referring Link” – we’ll explain what this means in this post. If a visitor arrives at your site via a search engine, the visitor has been referred to your site by the search engine therefore you will see a referring link from the search engine in your stats. In other words, you will only see a referring link in your stats, if a visitor has been referred to your site by another website, blog, forum or search engine. 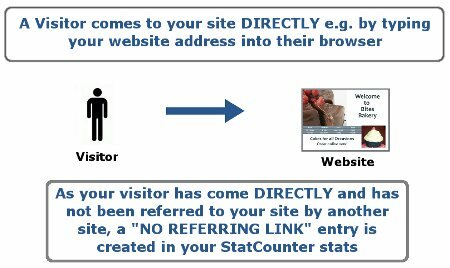 If a visitor arrives at your site by typing your website address directly into their browser, the visitor has NOT been referred to your site by any other site, therefore you will see a “No Referring Link” entry in your StatCounter stats. In other words, if a vistor comes to your site directly (i.e. without being referred to your site by any other site), then there is no referring link for that visitor. No Referring Link – what’s the significance? People may get to know your web address offline (e.g. in flyers or newspapers) so they simply go directly to your site rather than looking for your site in a search engine. You may have a lot of returning visitors who have bookmarked your site so that they can quickly revisit it. As usual, comments, questions and suggestions welcome! UPDATE: To ensure that all referring links are captured, you should make sure that you have StatCounter code installed on all pages of your site. It is not sufficient to have StatCounter installed on your homepage only. This is because visitors may enter your site at any page not just your homepage. Thanks for explaining the “No Referring Link” thing. It’s really confusing when you see this as a high number and are wondering if that many people are typing in your web address everyday. It didn’t occur to me that it can come from a bookmark. This is a great. Keep it going. Makes sense now. Thanks so much for the info and the service. Keep up the good work StatCounter Team. and still not been able to install it. Glad I have not paid money for this, or I would be one mad cat??? I am new to statcounter amd i have found this really useful for me for checking daily u-dates. Hi you guys! I ve been using SC since its beginning and i gotta admit it s served me well always. Recently I have observed some weird Chineese links as referal links and was wondering how they have been inserted in the stats? Obviously they re either bots or a new mechanism for visitor attraction.